Gallery - Category: Others - Picture: Miroku wa kawaii desu! 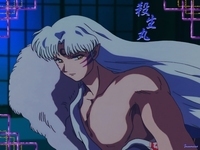 Still have Inuyasha to paint and Sesshomaru, Shippou and Koga to sketch. Who else should I do? I'll definitely do Inupapa and Inumama, and maybe Naraku. Who would you like to se e drawn like this? The hand print! The hand print lol! Typical miroku! Great!!! I would like to see Kaede, Jinenji, Ginta and Hakkaku.